When developing a new product there is no shortage of work to do. This work has to be organized, prioritized and sequenced. 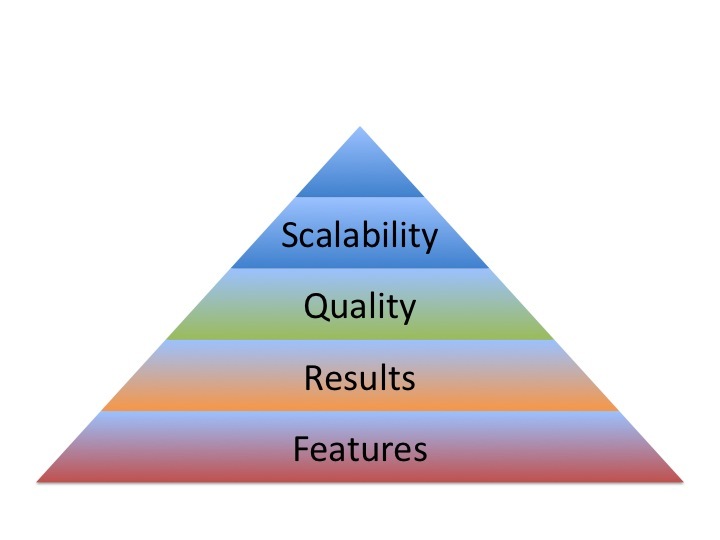 At a big picture level, priorities should be aligned with the hierarchy of needs depicted by the pyramid below. Working for example on self-provisioning before proving value, or QA automation before making sure that the product has an appealing set of features would not be the best use of resources. Sequencing work based on the hierarchy of needs aligns product development with business evolution, minimizes investment required at any given stage and helps in achieving business success. Note: If you are familiar with Maslow’s Theory of Human Motivation you will notice that this article has been influenced by his Hierarchy of Needs. You can find an overview of Maslow’s theory here.